For most people, five minutes a day isn’t enough time to check their Facebook status, write a quick email, or visit their favorite blog. It’s only a small bit of time after all, but it’s plenty of time for you do one thing that can make your entire day a whole lot better. So take five minutes of your day and give one of these 10 suggestions on how to lower stress, get more energy, and boost your mood a try. They might just give you the spark you need to overcome the challenges you face on a daily basis. While making your bed might cause flashbacks to daily childhood chores, the practice offers more than just a nostalgic trip down memory lane. As author Gretchen Rubin explains in her book, The Happiness Project, creating a soothing bedroom experience can help you develop a better “sleep hygiene” routine. In other words, the more relaxed and comfortable you feel while in your bedroom, the better sleep you’ll enjoy at night. So take a few minutes at the beginning of the day to make your bed, and you’ll reap the benefits every night at bedtime. Late afternoon hunger pangs can lead to many poor decisions when it comes to snacking. Get ahead of your inevitable decision to eat a candy bar or bag of chips to power you through the rest of your workday by taking a few minutes to pack a healthy snack in the morning. Yogurt, low-fat cheese, unsalted nuts, and fruit all make wonderful choices that provide you with a boost in energy late in the day without adding too many excess calories to your diet. A messy desk creates clutter that can distract you from work, while also helping to increase stress. Studies have shown that people can increase their productivity and concentration when working in a decluttered environment. So take a few minutes each day to straighten out those paper and wash out your coffee mug. You may be surprised to find out how big a difference such a small change can make. As a simple tip for lowering stress, take a moment to indulge your sense of smell. A Japanese study found that the smell of linalool – a substance found in lemons – may help to lower the ingrained flight-or-fight response in humans, and help lower stress. If yellow citrus fruit isn’t your thing, studies have also found that the smell of lavender, juniper, and basil can also help lower stress. While you don’t need to strike the “downward dog” position, you can still help reduce stress with the use of just a few simple movements. Stretching your arms overhead, raising and lowering your shoulders, and stretching out your legs while leaning against a wall can all help improve flexibility and circulation, and may even help loosen tightness in muscles caused by stress. A number of recent studies have shown that listening to music can help lower stress and blood pressure, while also boosting your mood. Listening to the right set of tunes can help to improve your day, so load up your MP3 player and take the time to create the right soundtrack for your commute to work or school. Just as your sense of smell can help reduce stress, your sense of taste can also help improve your day. Studies have shown that individuals who maintain fresh breath all day, whether from using mouthwash, brushing after meals, or chewing sugar-free gum, feel less stress and more confidence when interacting with others than individuals who don’t brush or maintain their oral hygiene throughout the day. Living in the information age allows people to stay connected at all times and never miss an email or a Facebook update. Of course staying constantly plugged in also ensures you never get a moment to yourself either. Take a few minutes a day to unplug from your smartphone, laptop, tablet, or any other gizmo that demands your attention or energy to take a short walk around the block or just admire the birds singing or the sun shining. Unplugging can be an especially important in the bedroom, as studies have shown that bringing electronic distractions – be it a TV or computer – into bed can make it more difficult to sleep at night. With the demands of family and work occupying so much of a person’s day, it can be difficult to find the time to take a moment for yourself. To help relieve stress, make yourself the top priority for just five minutes a day by doing something that you want. Whether reading a favorite blog, watching a funny video on YouTube, or just closing your eyes for a quick breather, take the time to step out of your hectic day. As the stresses of everyday life continue to pile up, it can become difficult to remember all of the things you’re thankful for. To keep things in better perspective, take the time to write down what you’re thankful for on that particular day in a journal, notebook, or Word document. Whether your list includes eating a great sandwich for lunch, enjoying a beautiful day outside, or getting a A on an exam, keeping track of the day’s highlight will help ensure you don’t always dwell on the negative. 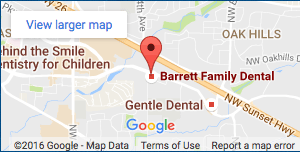 At Barrett Family Dental we are more then just the best dentistry Beaverton, OR has – we care about the whole you.